An indelible portrait of a woman who through great toughness of character blazes her own trail. Novelist William Haywood Henderson has won acclaim for his depictions of land and nature and his ability to bring the American West to vivid life. Of his most recent novel, The Rest of the Earth, Annie Proulx remarked that Henderson "writes some of the most evocative and transcendently beautiful prose in contemporary American literature." Redolent with myth, humor, strange landscapes, and stark reality, Henderson's new novel tells the story of Augusta Locke, a troubled yet spirited woman, as she raises her daughter in the deserts of Wyoming. Spanning the twentieth century, Augusta's extraordinary challenges play out themes of love and loss, home and family, redemption and reconciliation. "William Haywood Henderson's Augusta Locke is such a gravely beautiful read that you have to stop every few pages to catch your breath." 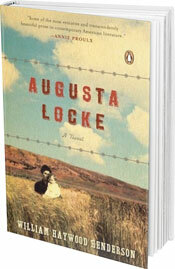 "Augusta Locke is an uncommonly beautiful, haunting book. The writing is like prose poetry, ethereal and earthy at the same time. As we move through Gussie's life, starting at the beginning of the 20th century, the landscape of the American west comes across as a living thing. Meanwhile, the characters who pass through her life are well-drawn, memorable, and not at all simple, whether minor players or major figures. ...Henderson has managed to create one of the most arresting female literary characters in quite some time." "Henderson's novel is an extraordinarily beautiful creation, brought to the reader on the wings of the ravens that serve as its protagonist's familiars. Told in languorous prose virtually encrusted with the details of nature—very reminiscent of Annie Dillard—this story follows Gussie Locke through a lifetime of wandering. ... The tender descriptions of Gussie's love for her child are especially touching, given her hardness elsewhere. Rarely is a woman portrayed in this way without reducing her to someone with some kind of gender confusion, but Henderson avoids these clichés. Gussie is truly her own kind of woman, and her own kind of mother. As much a story of lineage and the meaning of family as it is a story of nature, this novel covers a lot of ground in greater detail than one would imagine possible in some 400 pages. Read slowly, and enjoy this raw and haunting tale." "Augusta Locke is a fascinating and powerful character, matter-of-fact and not self-pitying. ... While she spends her days anchored in the beauty and harshness of Western landscapes...thoughts of her mother, Leota, her father, Brud, and her daughter, Anne, recycle in her mind. So does the figure of Anne's father, Jack Fisher, who was but a one-night-stand in Gussie's teen years, on the verge of his departure for the Great War, although he is to resurface in her life decades later in startling fashion. ... These characters become like fetish dolls that Gussie caresses over and over in her mind's eye, the past renewing itself, phoenix-like..."
"Resonates with poetic beauty and complexity. ... Like the many life-hardened pioneers who have come before her, Gussie Locke is tough. Henderson creates a woman who is achingly human in her unquenchable longing for something of life that is more tangible, more meaningful. Even the supporting cast of characters in Augusta Locke is unexpectedly unique and complex. ... [T]he novel echoes with deeper themes of longing and abandonment, intimacy and loneliness. With such keen attention to nuance, Henderson creates a world that is both epic and universal and, perhaps above all, eminently readable." "Against the enormous beauty of the American [West] depicted in Henderson's third novel, people cast small but significant shadows while tending to families as fragile as fallen leaves. The hero of this century-spanning epic is a tough, restless woman, Augusta 'Gussie' Locke. ... Saturated with details of the natural [West], Henderson's work etches in high relief the image of a solitary life among scenic riches." "William Haywood Henderson understands the emotional landscape of the American West, defined by loss, hope, and life on the wing. And, like the birds that sweep through Augusta Locke's world, Henderson's writing soars."